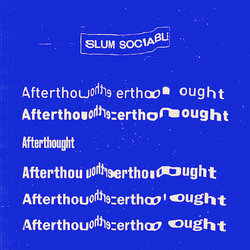 Slum Sociable are proud to reveal a striking new single ‘Afterthought’ - out today through Liberation Records. It’s the third track to surface from the subversive Melbourne duo this year and falls just four weeks away from their headline show in Melbourne, dubbed The First Annual Slum Sociable Xmas Special, which is set to take place at the Corner Hotel on 13 December. ‘Afterthought’ is an up-tempo summer heater and the duos most dance-ready tune to date. Slum Sociable teamed up with Kim Moyes of The Presets, to bring the idea to life. They also shared production duties with Konstantin Kersting (Mallrat, The Jungle Giants). ‘Afterthought’ focuses on Miller Upchurch’s renowned vocals, as they soar atop tight drum machines and chunky synthesizers.